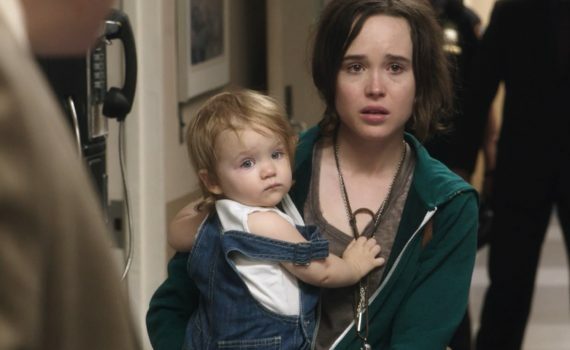 In 2007, Page & Janney teamed up with an unbeatable cast in an unforeseeable hit, imprinting Juno on our collective minds for all time. That would be Diablo Cody’s one & only cinematic success, and, in a way, Page’s too. She’s had a few small roles in a few solid films, a few major roles in fewer, and has basically coasted along as a b-level talent for the past 10 years. But that’s about to change, if Tallulah has anything to say about it. Page & Janney are both back on the map with this drama, a film that showcases the best they have to offer while delivering a brand new take on an old story. Written by, directed by, and starring women, Hollywood is benefiting from movies like this, an alternative to the usual fare, a breath of fresh air. Tallulah, or just Lu, which is much easier, is a free spirit to make all others seem typical. She lives in a van, travels where she wants, ties herself down with nothing, and is ready to move on to the next adventure at a moment’s notice. This lifestyle might be a little lonely, which is why Lu teams up with Nico, a rich boy who wants to escape the mundane modern existence. Lu & Nico fall in love, but when he wants to go back home, their relationship is shattered. Desperate to find him, and honestly to get a little quick cash, Lu visits Nico’ mother Margo, who wants nothing to do with her. A chance encounter with a neglectful mother of an innocent toddler will give Lu exactly the means she needs to convince Margo to help; a child who can be passed off as Nico’s, at least until Margo watches the news. This film is a dangerous balance of good & bad, mostly when it comes to the acting, but thankfully remains steady enough to let a few stars shine & win over audiences before anything falls to pieces. Page & Janney are tremendous, playing their characters with a natural charisma & comedy that lightens the heavy mood, convinces us of their sincerity, and impresses with pure talent. Tammy Blanchard nearly steals the show still, as the screwed up mom who is just as pathetic as she is able to break your heart. But the rest of the cast is utterly awful: Nico, the policemen, the stereotypically gay couple, and Suzanne “Crazy Eyes” Warren as a Child Services worker. They almost mess things up, as do a few unnecessary out-of-body experience sequences, but the foundation of the film holds out just long enough to reach the finish line without falling on its face. The first hour is much better than the back end, Page & Janney impress, and the movie as a whole entertains, despite a few flaws, so watch with confidence and a few tissues handy for those who lean toward the emotional.